Home » WTF Japan? » Collection…Or Obsession? You Decide. Since I’ve been living in Japan, I’ve seen a record number of people who like to collect things. I mean, they REALLY like to collect things. Everything from Gundam robots to antique shoes. 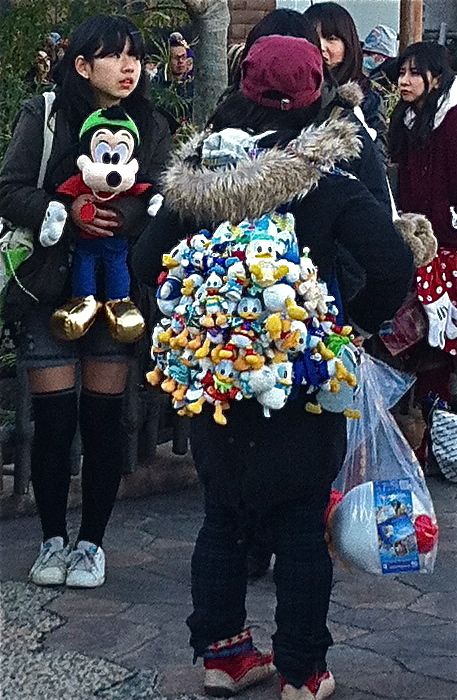 But I totally had to admire the single-minded duck devotion this backpack displays! I was debating whether or not to post this as on the one hand I’d like to maintain my James Bondesque reputation for British coolness and yet on the other hand that is an utterly epic collection. Therefore I will go ahead and share that when I saw the photo I inadvertently squealed out, “Duckpack.” Go ahead, judge, but I’ll still be over for martinis and poker at 8pm. Omg I saw people like that in Disney Sea the other day and thought they were crazy! But I guess it’s kinda like dressing up to an event and these people are just paying respect to Disney? Still weird….. This girl was at Disney Sea! Maybe she’s a permanent resident And yeah, I guess this slightly scary level of duck tribute IS a kind of respect, huh.